<pNobody likes being forced to do something they’re not good at. Reading for fun might not be every kid’s cup of tea but having bad reading habits can have a knock-on effect on other aspects of their learning too. Children that are struggling to learn how to read might need a bit of extra support, especially if they find the experience stressful, so we got some tips on how to make it easier. Learning to read isn’t easy, and the pressure is on: one in five children leaving primary school are failing to achieve the right reading level to give them the best chance at secondary school and their poor reading skills could cause them to have low self-esteem, struggle to express themselves, and do badly in other subjects. 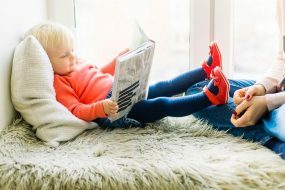 Everyone develops at their own pace but if learning to read is frustrating for your child then it can be easy to want to give up on books altogether. The best thing we can do for them is minimise stress and increase their confidence in reading, to make it seem less alien and, more importantly, fun! Make books less scary by turning your home into a reading-friendly environment. Books can become a part of everyday life if there are plenty of them about the house and young readers can see you curled up with a book of your own from time to time. Develop good reading habits by reading stories together at bedtime and keep it going with conversations about books over breakfast. Letting young readers choose the stories they want to read, and in what format, means that they are in control and can explore their own interests. If they get bored by conventional storybooks, why not let them try something else? Funny books for little pranksters, non-fiction for curious kids, activity books for adventurers… what’s important is that they help make reading a normal part of life. As well as the right environment and the right book, budding bookworms can be encouraged to develop their reading skills through games and activities. Rather than slogging through a book alone, through games they can have fun experimenting with letters and sounds to develop key linguistic skills that can make reading easier. Co-reading (reading aloud together) allows them to share the difficulties of reading with you, following the story with a finger or chiming in with the parts that they are confident with. By keeping up with regular bedtime stories, young readers become familiar with what books look like, what they can be about, and the physical act of holding a book, even if you are the one reading aloud. Co-reading is also a great way for young readers to access stories that are beyond their reading skill. Everyone is different and learning to read should be done at a comfortable pace, but if you do have concerns, it’s important to catch potential reading disabilities as early as possible. The most common disorder, dyslexia, can be detected at pre-school age. Things to look out for include delayed speech development; jumbling up long words, phrases, and rhyming; and struggling to learn the alphabet. At school, young readers with dyslexia often have spelling issues, visual disturbances (such as words ‘wiggling’ on the page), problems with sequences and patterns, and poor handwriting. A chat with a teacher or GP can help figure out exactly what level of support they might need. Take these tips on board and remember to build their confidence by fostering good reading habits at home and making reading fun. Struggling readers can get better with practice, a little help from their teacher, and some extra love and care from mum and dad.